Download Vienna Declaration of Environmental Standards for Healthcare Facilities in English (MS WORD format – 90KB), Armenian (MS WORD format – 50 KB / PDF – 343 KB) and Russian (MS WORD format – 50KB / PDF – 386 KB). 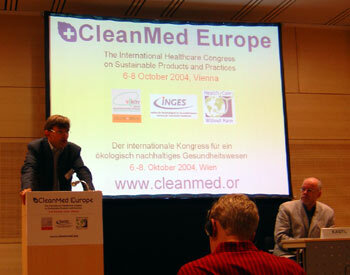 “CleanMed Europe” is the first international healthcare congress on sustainable products and practices in Europe. CleanMed has already been a huge success in the United states. 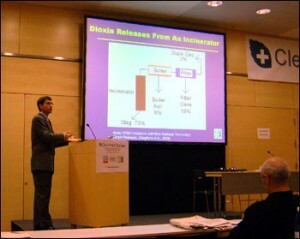 About 300 participants from 28 countries took part in the congress. There were 60 reporters, among them 15 from HCWH. NGO AWHHE participated in CleanMed from HCWH. The outcome of the Congress was Vienna Declaration of Environmental Standards for Healthcare Facilities. Continually increasing pollution and subsequent damage caused to natural ecosystems is seriously threatening the health of humans around the world. The operation of healthcare facilities is contributing to these environmental and health impacts. Society expects healthcare professionals not only to work at curing patients but also to prevent diseases while maintaining health. We strongly recognize the need to transform healthcare in a way, so that healthcare is ecologically sustainable and no longer a source to harm to public health and the environment. Environmental protection shall be a main principle for the operation of healthcare facilities. Environmental considerations shall be a main management principle and be taken into account in all decisions, procedures and practices without impairing the quality of care. That provides healthcare professional with the credibility to advocate necessary ecological changes in society and to give good examples for a more sustainable way of living. We recognize our responsibility for the people working and staying for healthcare facilities and consider avoiding pollution as a major contribution to health and wellbeing of employees, patients and visitors. Environmental protection and health protection both are major national and international policy goals. Taking that into account, the European Union and national governments should establish and extend the necessary legal framework for binding environmental standards in society and for healthcare facilities.